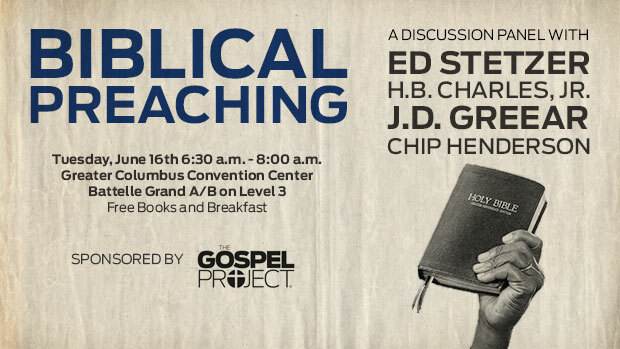 The Gospel Project is excited to host a discussion panel on preaching with Ed Stetzer, H.B. Charles Jr., Chip Henderson, and J.D. Greear. All of us agree that preaching is central to pastoral ministry and the spiritual formation of our local churches. All of would agree that the core message of our preaching should be centered on the biblical text. However, there are disagreements concerning philosophies and styles of preaching. Does expository preaching mean that you have to preach through books of the Bible? Where should the preacher start? Start with the text and move towards life application, or start with life application and find a text? Should one ever preach messages that don’t explicitly explain the gospel? How should one’s cultural and ethnic context shape preaching? How should the preacher utilize this personality and emotions in communicating the message? What is the role of apologetics in preaching? Who should the preacher consider as the primary audience for a sermon, the believer or unbeliever? What is the proper way to call for a response to a sermon? What is the relationship between preaching and place, especially when it comes to video venues? Join us on Tuesday, June 16, 2015 from 6:30-8:00am at the Greater Columbus Convention Center in Battelle Grand A/B on Level 3. We only have a limited seating capacity of 400, so sign up now to reserve your seat. We will serve a light breakfast, and every attendee will receive a bag of resources and books worth over $125.